Some people are intimidated by the whole writing reviews process. 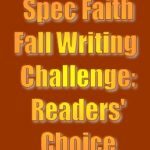 Since Spec Faith has added the review component to our library, I thought it might be helpful to look at writing reviews briefly, in the hopes that more readers will brave the waters of influence and post their thoughts here and elsewhere on the web. I remember the first time a writer asked me to post a review of their book on Amazon. I was terrified. Seriously! I mean, what did I know about writing reviews? And other people–strangers–would read what I said about someone else’s book? It was beyond intimidating, but I soldiered through. These days I’ve grown comfortable writing reviews, and yet I realize there are other readers who are still like I used to be. Consequently, they keep their opinions to themselves. Others, perhaps, have never seen the need to write reviews of the books they enjoy. Listening to writers (and any out there reading this, feel free to jump in and agree or disagree), I have come to the conclusion that receiving reviews makes a huge difference in how wide an audience a book reaches. 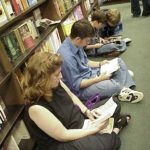 Reviews, like blog tours, are replacing the back-yard buzz or the water-cooler chat that used to give one person a chance to tell others about the book they’d read and loved. This is good news actually. In this era of the communication revolution, one person’s opinion reaches far more people today than fifteen, twenty years ago. In other words, stating your opinion has the potential to carry more influence than ever before. Still, some people remain intimidated by the whole process. 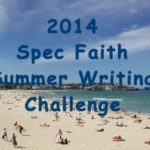 Since Spec Faith has added the review component to our library, I thought it might be helpful to look at writing reviews briefly, in the hopes that more readers will brave the waters of influence and post their thoughts here and elsewhere on the web. First, what a review is not (or ought not to be). A review is not a slam. A person writing a review should not vilify either the book or the author. A review is not a sales pitch. At the same time, a reviewer is not a shill and should not praise the book for the sole purpose of pushing sales. A review is not generic. No one benefits from a review that could fit any book whatsoever. A review is not a novel. I admit I have trouble here, but the truth is, if a review goes on and on and on, people are less likely to read it–or read all of it. Consequently, it loses some of its impact. A review is not a synopsis. Generally what the story is about is available as part of the book description, so a detailed recap isn’t necessary. In addition, readers who don’t want to know the surprises or ending of a book may inadvertently learn more than they wish if a review simply retells the story. Then what is a review? A review is an opinion, with reasons. A good review, in my opinion, is balanced. Rarely are books all good or all bad, and yet one particular aspect of a story can color our views. Harry Potter is a quick and convenient example. Some people hearing that the stories were about wizards allowed that fact to color their view of the books, and they looked no further. So too for reviewers–there might be one aspect of the story or writing that caused them to feel strongly one way or the other. I don’t think that’s bad or wrong or that a reviewer should shy away from telling such a fact. However, it’s good to be aware that not everyone will respond in the same way. Consequently, the kind of review that is most helpful doesn’t camp on just one aspect of a book–the one that caused the reviewer to love it or to hate it. A balanced review, then, points out things that the reader liked and things they might have liked better: I liked the main character because she seemed real, but I would have liked the story better if there wasn’t so much description. Finally, a good review will give a reader recommendation. Who, in your opinion, will most like this book? It’s just the reviewer’s opinion, so there’s no right or wrong. But what a help for readers looking for the kinds of books they want to read! 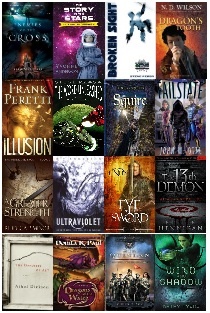 Covers, titles, endorsements, back cover copy, even first pages can be deceptive, but if a review, and especially if multiple reviews, by readers who have finished the book, say it is perfect for a certain audience, then chances are the recommendation will sway those looking for that particular type of story. I would like to write some reviews for this site some day. Thanks for the encouragement. That said, for me, writing reviews is a big pain, to say the least. I want to express my thoughts about books that I read, when I find ideas and connections that interest me in them. 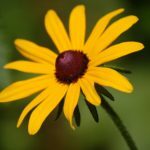 I want to help the authors by spreading the word about their books. But writing reviews is just plain hard, one of the hardest things I can contemplate doing. For one thing, I usually have to read something twice in order to clarify my thoughts well enough to write a review. Do you have any suggestions on how to read deeply and carefully enough the first time that re-reading is unnecessary in order to review? I’ve tried taking notes, and that does help, but then I get caught up in noting every little idea that pops into my head, and I get pulled out of the story. I think taking notes is good too, though you might want to keep any note-taking for chapter breaks. And then keep it simple–over all impressions, perhaps. When I write reviews, I usually try to ask myself why questions: why did I like that character, why did that “surprise” seem predictable, why did I cry at the end (or not)? I wish I could help about the reading issue, but the truth is, I’m a slow reader. It’s always been the bane of my reading life, but also the blessing because I do “get things” as I plod along! You might try reading out loud, at the beginning, perhaps, or whenever you find yourself flying through a book and want to slow down a bit. One last suggestion. How about trying an intermediary step–instead of starting by writing reviews, write a few recommendations. Here at Spec Faith those can go right into the comments section of the novel entry. At Amazon or Goodreads or B&N they would simply be short and to the point. A lot of people like those the best. Once you get comfortable with those, then you can launch out to full reviews. Just a thought. I look forward to whatever you decide. I think taking notes is good too, though you might want to keep any note-taking for chapter breaks. That’s exactly how it is for me. How about trying an intermediary step–instead of starting by writing reviews, write a few recommendations. I’m thinking deeper, substantial reviews for blogs and ezines, including my own blog and full reviews here. Then, if I read something and have thoughts about it that I can express quickly but am not motivated enough to write a full review, that’s where databases like Amazon, Goodreads, the Internet Movie Database, and the Interactive Fiction Database are appropriate. I like this. Reviews have to be charitable (writers are people, too), while still being honest and helpful. I suppose the key is to tell the truth, but tell it kindly. Harsh attacks are not always out of line, but I think they should be reserved for books that are malignant. (As opposed to merely, in the artistic sense, bad.) Once I was browsing Plugged In’s movie reviews, because I do this for fun, and I saw a movie title with a biblical ring to it. Thinking it might be an interesting review, I read it. The movie’s basic idea is that the archangel Michael rebels against God – and he’s right. As he says to Gabriel, “I gave Him what He needed.” A story that re-dresses Satan as Michael and approves of his rebellion is malignant, and it’s due for some hard words. But most errors are lesser, and they should be given gentler treatment. G. K. Chesterton once said that as even a bad man is still a man, so a bad poet is still a poet – and I’d extend the same regard to a bad novelist. I’m working toward being more consistent about posting reviews on Amazon and Goodreads. 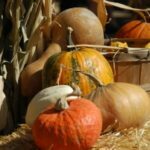 Is it OK to copy those reviews and submit them here? Hello, Kristin! More thoughts on Spec-Faith reviews are here, and a complete listing of our review-submission policy is at the review-submission form. Previously published reviews are more than welcome, if the reviewer him- or herself is copying and submitting the review. We’d only ask that you include the original source (especially if it is your own blog or website), so that you as the author can receive due credit.